At the end of last week, the WPI team along with Ficks and Mabie collected the forty tires necessary to build the ECD playground structure. The plan for today was to initially split into two groups: one for structure location finalization and tire preparation, and the other for paint and supply purchases. We later reconvened and painted the tires as one group. “Unjani? (How are you? ),” Mdu declares as we get out of our bus in an all too familiar way. Today our goal is simple: fuel the fire of our project momentum. Because the community is interested in tangible progress, building a relatively simple tire structure is just what we need to keep moving forward as we sort out the logistical matters of the community hall in the background. At the hardware store, Ficks takes the reins. Every inquiry from a WPI team member is met with “No, we don’t need that” or “No, that’s too expensive” or “We can find something in the community to use.” This kind of input is welcomed but also a little unforeseen as none of these purchases are coming out of the community’s budget. Without a financial stake in this whatsoever, it is both informative and humbling that he refuses to buy a R13 bucket, because he knows we can work around it. When we return to the settlement everything is ready. We distribute brushes and get to work. Cam, Paul and Amy were only able to talk Ficks into letting us buy four brushes, so a painting rotation is created. As the day winds down, a few of the ladies in the settlement start cleaning the brushes on a large, grey cement cylinder that regretfully sits in the centre of the community. Though everyone in the community knows what it is when described, its dreary, bare walls serve no purpose. Neziswa and Babalwa see this wiping as an opportunity for change. As they wipe off their brushes, they do so with great care. The barren mass has become their canvas, and they leave a “K2” and a heart on it. A few others get in on the fun, but the transformation is only complete when every team member’s hand has left its mark on the wall. Some of our co-researchers were confused by the fact that we were not building the community hall but were instead working on something else. This shows us that clear communication with co-researchers is essential during the whole process. Though we faced this challenge, today was a good day for the K2/WPI team. Everyone played equally important roles. Through collaboration and innovation we were able to not only accomplish the day’s goal of painting for the play structure, but also make an unanticipated, but appreciated change in the community with our mural on the cylinder. It was an empowering example of how much this community is capable of accomplishing on their own and this certainly resonated with those involved. 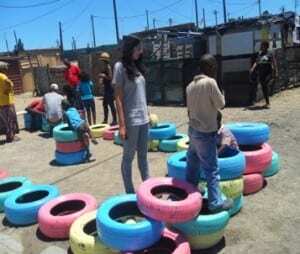 Today we really encouraged community participation, as we rotated through everyone while we were painting. We were pleasantly surprised when other community members, whom we had not worked with came out and asked about the project.